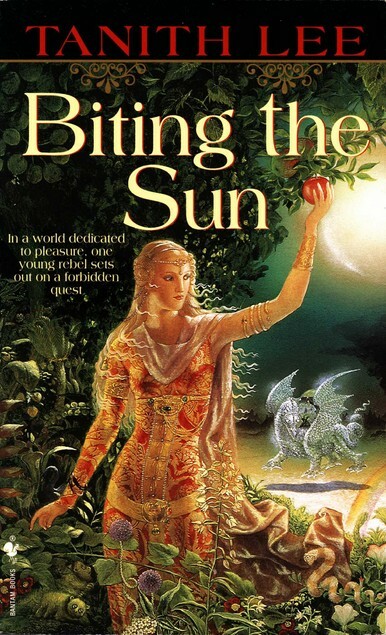 Biting the Sun is an omnibus containing both of Tanith Lee’s Four BEE novels, Don’t Bite the Sun and Drinking Sapphire Wine, originally published in the 1970s. These two short science fiction books work best as a single volume: the first introduces the world and explores the main protagonist’s struggles with finding meaning within its confines, and the second has more forward momentum and is a more satisfying story. My friend Hergal had killed himself again. This was the fortieth time he had crashed his bird-plane on to the Zeefahr Monument and had to have a new body made. And when I went to visit him at Limbo, I was wandering around for ages before the robot found him for me. He was dark this time, about a foot taller, with very long hair and a mustache, all glittery gold fibers, and these silly wings growing out of his shoulders and ankles. Biting the Sun‘s narrator (whose name is never revealed) lives in the dome Four BEE and is Jang, a young-ish person who has completed hypno-school and the child stage of life but is not yet considered ready to be an Older Person. Jang are expected to spend about half a century completely devoted to seeking pleasure and recreation before moving on to the next stage of life, and their most common problem seems to be recognizing their own friends. Mortality is no longer an issue since humans can—and quite frequently do—change bodies, and when someone dies, their consciousness is simply transferred to a new body. After being Jang for about a quarter of a century, the main protagonist becomes bored with hedonistic pursuits. Don’t Bite the Sun largely focuses on her attempts to find purpose in her life, only to find that her efficiently run society does not allow for much individual creativity or achievement. When Drinking Sapphire Wine begins, he (though the main character identifies as predominantly female and is usually a woman throughout these books, the narrator was male at the time) has become fascinated with reading the History Records and revives an old tradition—and in doing so, commits a crime unheard of for ages. As punishment, his memory will be erased and he will eventually be reintegrated into the community as a whole new person, but he is given a choice about whether to do so immediately or live out the remainder of this life first—as an exile in the desert in one final body that will ultimately age and die (which, he is informed, is not a recommended experience). Biting the Sun is an odd pair of books. After finishing Don’t Bite the Sun, I felt that, though it was readable, I didn’t really like it: having to constantly refer to the Jang slang glossary at first was distracting, a bored main character makes for a somewhat boring story, the final chapter made me roll my eyes, and it was just overall a very strange book. And yet… It definitely grew on me, even if I still don’t love it. Drinking Sapphire Wine was a better book with more plot progression, and even though it utilized some common tropes and could be predictable, I found this omnibus fresher and more memorable than many of the books I’ve read (or tried to read) lately. My thoughts keeping going back to it, and I’ve found it’s a book I enjoy having read even if I didn’t always enjoy reading it (especially the first of the two books). The highlight of this story is how immersive it is: readers are thrown right into the world and see it through the narrator’s eyes, getting a clear picture of what it’s like to be Jang, to live in a world with no responsibilities—one in which people can design their own bodies and change them almost like clothes. (Almost, because although people do often switch bodies, there are also some limits to how often they can do so!) Though these two books give a great overview of the main protagonist’s world, they do not delve into how it came to be that way or why certain rules are in place. Personally, I would have liked to have had a better understanding of the ins and outs of this universe Lee created, especially since there was a lot that I didn’t feel entirely made sense, but I also felt that this worked well with the story and character despite my preference. After all, the narrator has no reason to be concerned with the hows and whys of her world as she’s going through her everyday life, and my feeling that the universe was pretty and shiny on the surface but lacking depth was actually quite fitting given that this matched what she experienced. Though character-focused due to the centrality of the main character and her obstacles, I didn’t feel like she had a wholly fleshed out personality beyond that she had a desire to create that wasn’t being met. Once again, this lack actually was suited to her world and situation since her world didn’t value or need individual creativity, and she is a sympathetic character as one who doesn’t fit in and is searching for a purpose, but I didn’t find her a particularly compelling character. Biting the Sun does not have particularly original ideas (at least, to me as someone reading it about 40 years after it was published) but its execution makes it both unique and frustrating. Though I want more detail and depth, any shallowness or character or worldbuilding seems fitting since it is primarily about a character who does live a charmed (if dull) life—just as it seems fitting that the second book in the omnibus has more substance. It is, at least, an interesting book to ponder—an unforgettable book, even—even if it wasn’t entirely my cup of tea. This book is November’s selection from a poll on Patreon. 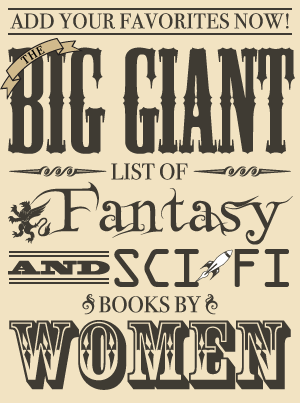 Since November is Sci-Fi Month hosted by Rinn Reads and Over the Effing Rainbow, the November book is science fiction!